The Department of Homeland Security’s Science and Technology Directorate on June 28 unveiled its new Enhanced Dynamic Geo-Social Environment virtual training platform, which resembles an augmented reality video game. EDGE is an online, multiplayer environment that allows first responders to practice incident response scenarios. Tabitha Dwyer, creative director for EDGE, showcased the platform through a scenario depicting two active shooters at a hotel that later caught on fire. 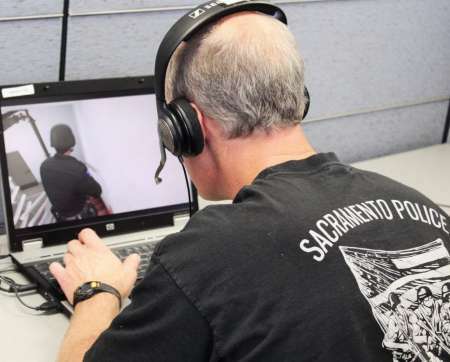 Trainees logging in to the scenario can modify their character to reflect their gender, appearance, and role, such as civilian, fire officer, law enforcement officer, suspect, or other. There is a radio feature, allowing participants to speak to colleagues in their vicinity and at a distance. Although Dwyer spent most of the time viewing the situation through the first-person point of view of her character, the platform also has a feature in which a participant can leave her body and gain a third-person, aerial perspective. Players can also jump to the perspective of their teammates to assess how a situation looks from their eyes. EDGE also has a whiteboard tool, where trainees can sketch their plan for maneuvering on a board that everyone participating can view. Both the visuals and the audio of the scenarios presented on EDGE are recorded, so that first responders can watch replays of the situation and determine where they could have improved. “If someone’s in Washington and I’m in Florida, we can have a shared understanding of what we’re going to do,” Dwyer said. S&T’s First Responder Group created EDGE in tandem with the Army Research Laboratory’s Simulation and Training Technology Center and Cole Engineering Services. The platform was designed through the Unreal gaming engine, which was used to create Mortal Kombat, BioShock, and Batman: Arkham City. Dwyer emphasized the “sandbox” nature of the platform, stating it is a place in which teams can hone their collaboration and communication. She said, rather than focusing on individual skills, EDGE allows an arena for teamwork.